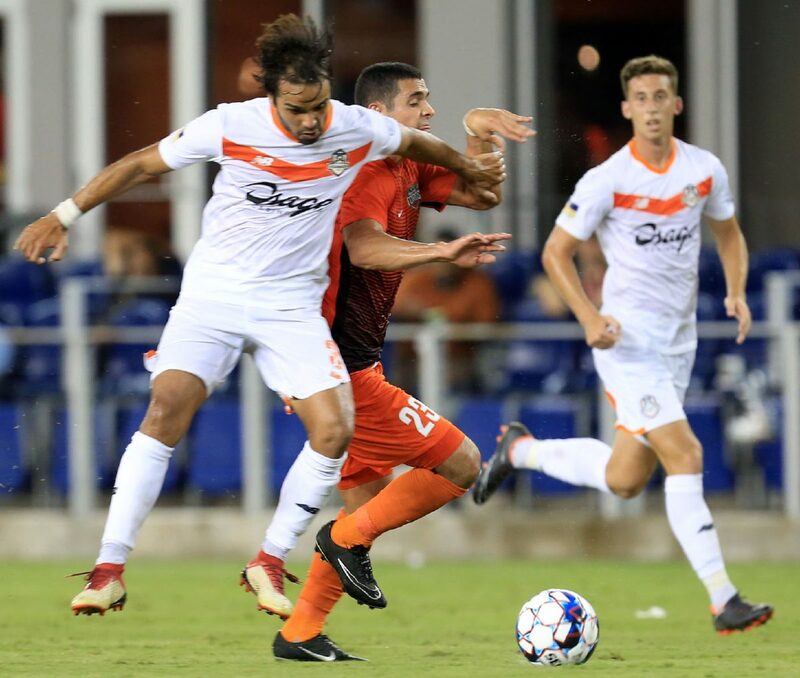 EDINBURG — After RGV FC’s Jesus Enriquez scored in the 75th minute Saturday to snap his team’s 330-minute scoreless drought, Toros coach Gerson Echeverry turned to his assistants, preparing to make a substitution in hopes of protecting RGV’s one-goal advantage. The next time he looked to the field, just 35 seconds after the restart, Tulsa’s Paris Gee was firing a shot into RGV’s net. 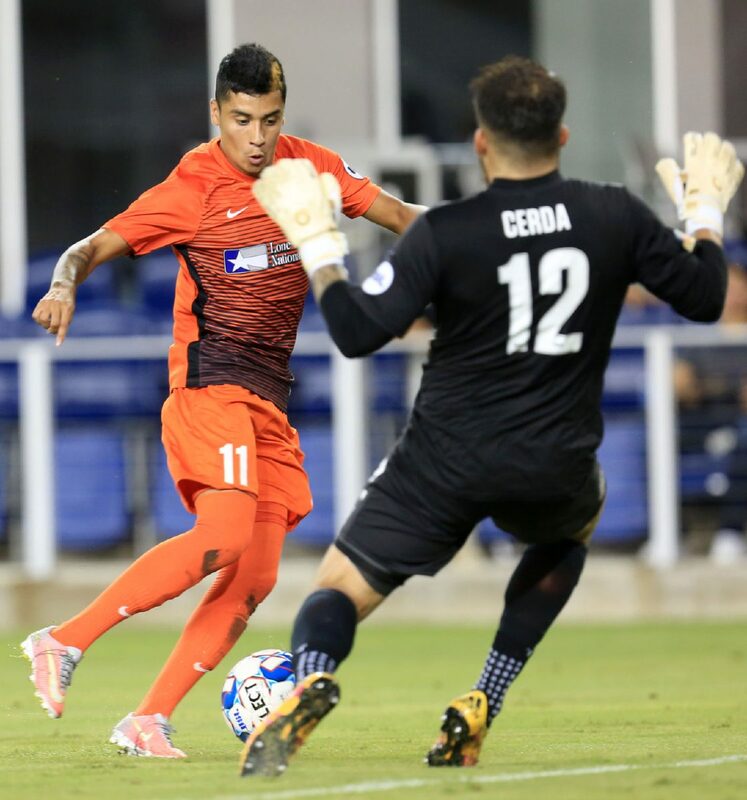 Tulsa’s equalizer in the 77th minute pushed RGV’s winless streak to a franchise-record 11 matches, as Saturday’s contest finished level at 1-1 at H-E-B Park. The result moves RGV FC’s record to 1-6-10 on the year, with 13 points ranking third from the bottom in the USL’s Western Conference standings. Tulsa is one of the only teams behind RGV, sitting 1-8-9 with 12 points. RGV FC's Bryce Marion shoots the ball, but has it blocked by Tulsa's Paris Gee during the second half of their game Saturday, July 7, 2018 at H-E-B Park in Edinburg. The Toros tied the game 1-1. RGV FC's Aldo Quintanilla is blocked by Tulsa's Claudio Muñoz from making a run during the second half of their game Saturday, July 7, 2018 at H-E-B Park in Edinburg. The Toros tied the game 1-1. The Toros looked poised to capture their first win since April 25 after scoring first on Saturday, but their advantage was short-lived. Toros midfielder Bryce Marion, who assisted on the goal, said RGV was frustrated to concede so quickly. He added that the Toros relaxed after their score, leaving them vulnerable. Tulsa entered Saturday having allowed 36 goals in 17 matches, the worst mark in the Western Conference. But Saturday’s match was level into the second half before Marion entered as a sub in the 65th minute and Enriquez came on as a sub in the 74th. Only a few seconds after Enriquez entered, Marion stole the ball away from a Tulsa defender on the right wing, dribbled toward goal and sent a rolling cross through the box. Enriquez finished into the right side of the net from just left of the penalty spot. Echeverry said he hoped coming off the bench would light a fire under Enriquez, who had started the team’s previous 10 matches. 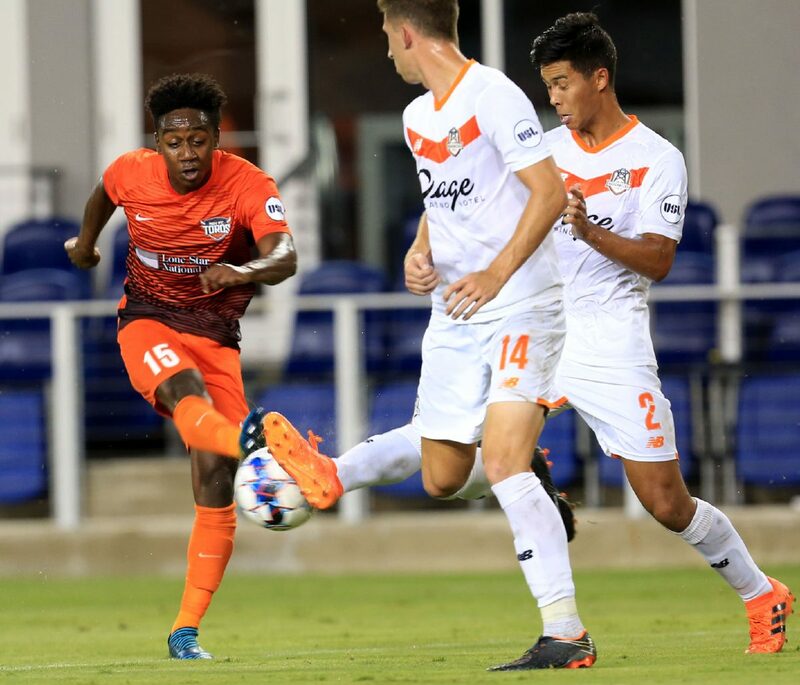 Echeverry added that RGV FC’s offensive players should all feel pushed after the team announced the signing of forward Carlos Small on Friday. The tally was Enriquez’s second of the season. Gee tallied for Tulsa on a give-and-go play. He had his back to the net about 25 yards from goal when he received the ball and flicked a pass to Jesus Ferreira on his first touch. Gee spun and sprinted toward the net, taking possession of the return pass about 20 yards from goal. He took a few dribbles into the right side of the penalty box and fired a low shot into the left side of the net past RGV keeper Nico Corti. Still, Marion believed RGV had time to rally. Saturday marked yet another match in which the Toros felt they got the better of play before a lackluster result. RGV maintained 58.9 percent of possession for the match and outshot Tulsa 15-10, including a 6-2 margin in shots on target. But the Toros found just one goal and continue to rank tied for last in the USL with only 15 tallies on the season.